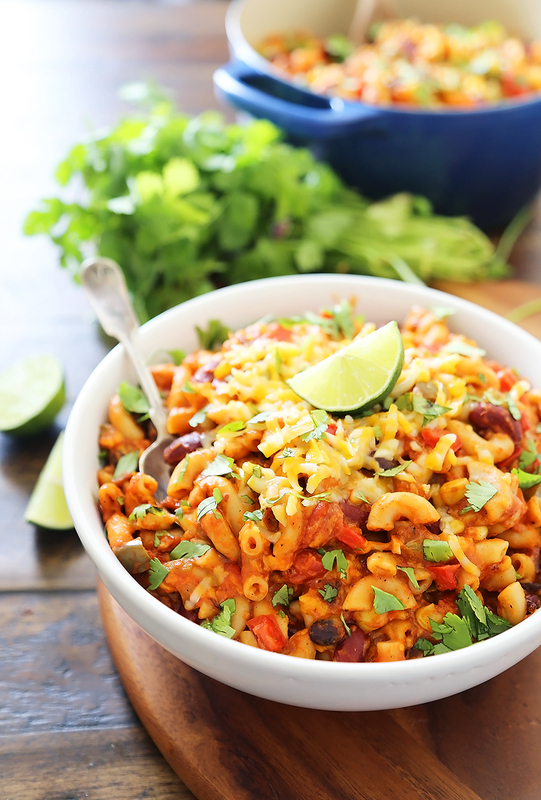 Super cheesy, comforting, and simple to make for meatless weeknights! 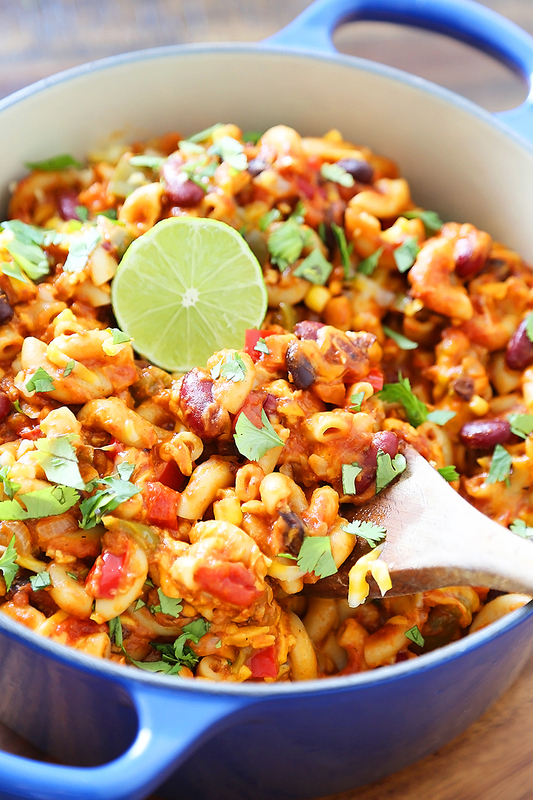 Every bite is chock full of fresh veggies, beans, tomatoes and tender pasta. This easy one-pot meal will easily become your new family favorite. Ready to enjoy in just 30 minutes! Don’t you want to just dive right in? On a cozy night in with my family, these are the comfort food meals I live for! There is nothing like a bowl of this hearty, belly-filling goodness to make your day right, and it is quick enough to cook when you come home from work. 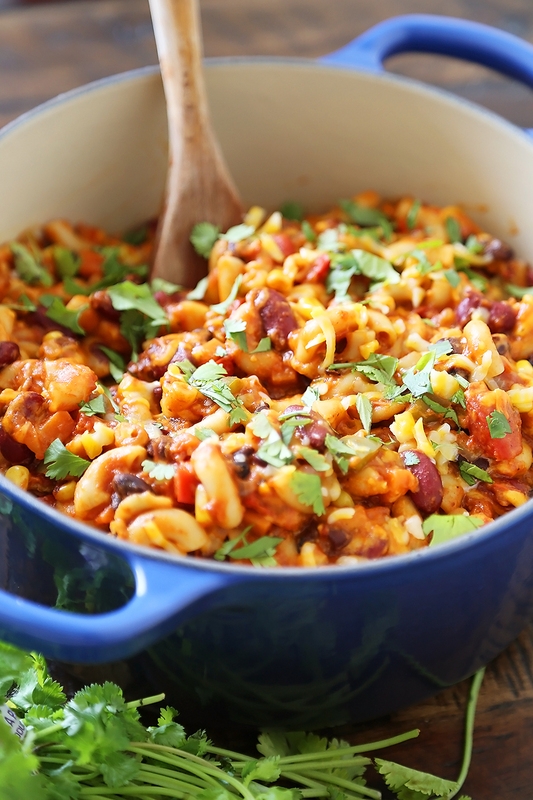 It is chock full of vegetables, beans, spices, tomatoes, tender pasta and gooey cheese. Add a handful of fresh cilantro and a squeeze of citrusy lime, and you’ve got an easy vegetarian meal. There’s something in this big bowl for the whole family to enjoy! 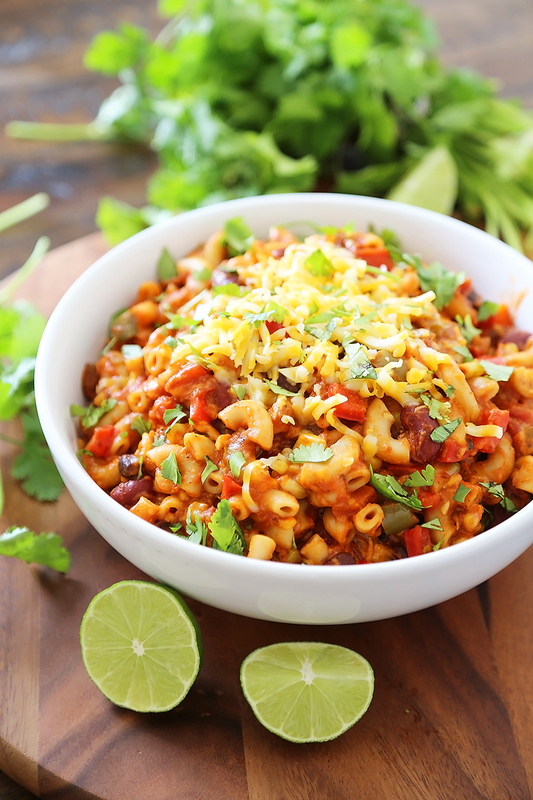 Especially when you’re preparing for a busy Monday through Friday, this chili mac is best to cook on a Sunday for those “what’s for dinner” days ahead. I love to take the guesswork out of at least two days per week, and make-ahead meals like this are perfect for reheating and enjoying with minimal fuss. 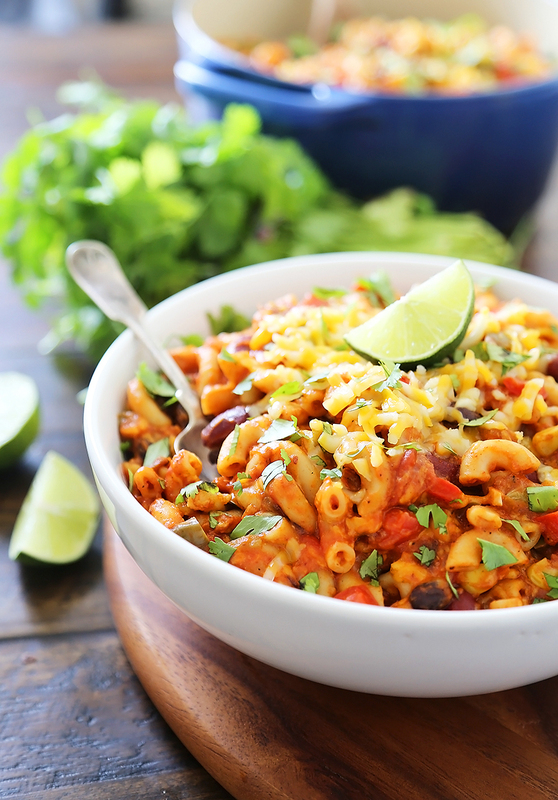 Want to whip up your own veggie-packed chili mac? Keep reading for the recipe and lots more mouthwatering photos! Though this is a vegetarian recipe, feel free to add about 1 lb. (16 oz.) of pre-cooked meat such as chicken, beef, or turkey. I like to cook it in the pot ahead of simmering the chili, then add the protein during the last 10 minutes of cooking time. Adding meat will increase the serving size of the recipe, too, so expect to either freeze some for later (hello, expecting mamas!) or feed a crowd. You will get about 8-10 servings with this amount of meat added. The ingredients are plentiful, but all combine to make an amazingly flavorful, standout supper. To start, you will need bell peppers, onions, garlic and carrots. Sizzle them until soft and tender, then in go your spices! Chili powder, cumin, oregano, salt and pepper make up the cast of zesty seasonings. Next in the pot, diced green chiles (the canned variety, or amp up the heat with one minced jalapeno), corn, kidney beans, black beans, and water (or, you can use vegetable broth). When all your ingredients are added and up to a rolling boil, pop in your macaroni and cook until the pasta is tender, stirring occasionally. 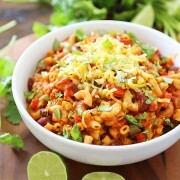 While my pasta simmers, I usually prep my toppings – cilantro, cheddar, hot sauce, and a few fresh limes for me, please! 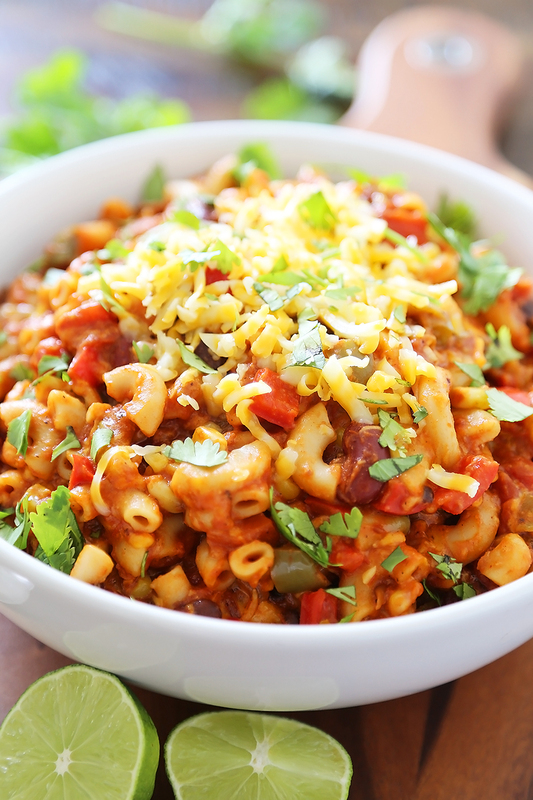 This hearty, cheesy meal really comes alive with some fun, fresh additions served on top. Stir your cheese into your pasta, top it with whatever you like (makes it a fun DIY dinner for family and friends), and you’re ready to serve! Set a large saucepan to medium heat; add olive oil. Once hot, sauté onion, bell peppers, carrot and garlic for 10 minutes. Stir in chili powder, cumin, oregano, salt, pepper, green chiles and corn. Stir in crushed tomatoes, diced tomatoes, beans and water. Increase heat to medium-high; bring to a boil. Once boiling, add macaroni. Cook macaroni according to package instructions, stirring occasionally, until the macaroni is tender and cooked through, usually 10 minutes. Remove from heat. Stir in shredded cheese. Serve with desired toppings. If you would like to add a protein (beef, chicken, turkey, tofu, etc. ), either add pre-cooked or cook in your pot before starting vegetables. Set aside, and add cooked protein to the chili pot during the last 10 minutes of cooking time.